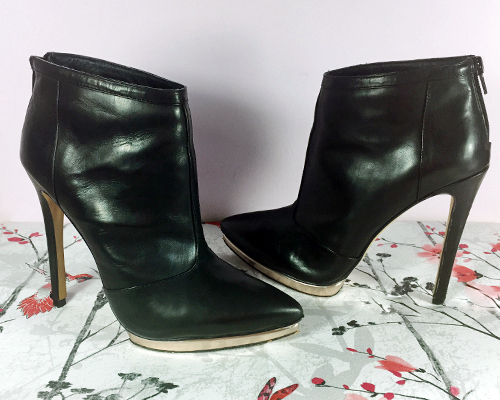 If there’s one thing every heel lover should have it’s a good pair of black ankle boots. I’ve searched high and low for my idea of the perfect pair; they have to be plain, classic and go with absolutely everything (even a boiler suit). My search led me to the Forever Unique black ankle boots and thus, this post was born. When I found these oh so beautiful ankle boots I knew fine well my search had come to a rather delightful end. These shoes are exactly what I want; they’re everything I described above and so much more. Now the heel isn’t for the faint hearted and neither is the angle your feet are held it while wearing these boots. A 5 inch heel is something I’m beginning to master but after a lengthy break from stilettos the shoes are absolute murder on my feet. I can wear these shoes for about 40 minutes of non-stop walking and standing before my feet demand the shoes are removed. As for the actual boots well, they’re incredibly soft to touch and are extremely well made. I always feel like whenever I’m wearing cheaper heels (sorry to sound like a shoe snob here) that the heel is bending with each step but so far, I haven’t felt that with these ankle boots. The rose gold detail on the sole is what really sold these ankle boots for me. Like I said at the beginning of the post, I wanted something that was plain but I can never resist some form of jazzy detail. I’m a sucker for something shiny and unexpected. My only concern with the Forever Unique black ankle boots is there seems to be a sign of wear and tear already on the left one. I noticed the little creases on the leather shortly after I first put them on and, although they’re on the inside and hidden from view, it still irritates me. Aside from my minor concern I can’t get enough of the Forever Unique black ankle boots. I’m so happy I ended my search for the perfect pair with these boots. Hopefully I’ll have these shoes for a long time and will rock them with many boiler suits. Hey, a girl can dream right? *Update: These boots lasted me until January 2016. The heel on the left boot snapped and is beyond repair. The search for the perfect pair of boots is back on. Getting ready in the morning involves pulling out all of the make up I need for that day as quickly as possible before slamming the drawer shut. It's not that I don’t enjoy shoving chemicals on my face in an attempt to make myself look pretty (so far I haven’t achieved this yet) it's just my make up drawer is disgusting. 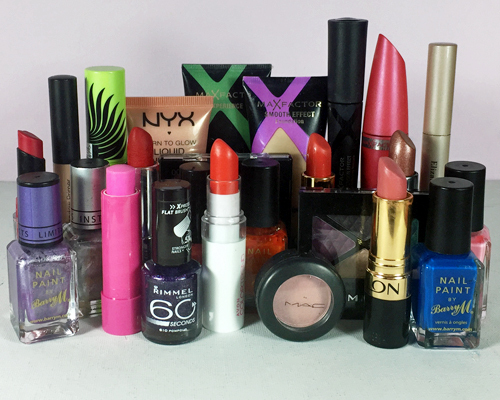 My make up stash is tiny in comparison to a lot of people’s collection but it seems to have some very old products in it. I used to buy a lot of unnecessary items when I first started out as a beauty blogger (5 years ago, get me) as I thought I needed absolutely everything. Now that I’m an adult (supposedly) I realise that I really don’t need every single new make up release. If this was all I had gotten rid of I wouldn't be so grossed out by myself. It’s quite disturbing how many products I’ve gotten rid of today. Over half of my make up collection is now sitting in the bin. I couldn’t even sell any of it as most of it has been sitting there for so long it’s probably not even safe to take the lids off of them let alone use them. The majority of the things I threw away were nail polish. I am the worst when it comes to nail polish as I just want it all. 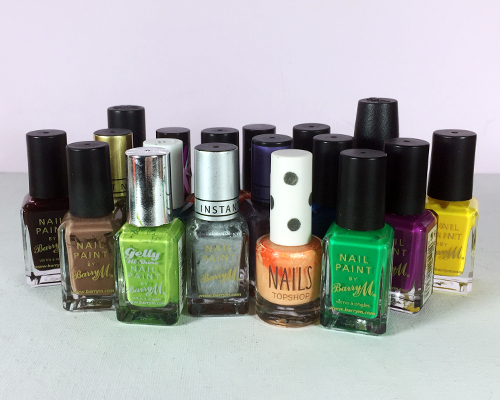 I kept buying colours that I either already had or didn’t actually like once they were on my nails (orange and I really don’t get along yet I still bought loads of orange nail polish). Now I’ve whittled it down to just the ones I actually use as well as a couple of new ones that have yet to be used; something tells me I’m never going to use the new ones and should really get rid of them ASAP. As a result of this make up purge my collection is now very small and consists entirely of things I actually use erm, excluding those new nail polishes I just mentioned. Of course I’ll buy new make up from time to time but I’m going to be a lot more careful about what I do purchase. Long-time no see! I would love to tell you that I abandoned my own blog for 2 weeks because I was off doing something exciting and glamorous but that would just be a lie. I just haven’t had the energy, imagination or desire to blog recently. The dreaded writers/creative block didn’t really help either. Major blogger problems! I haven’t really done a personal post for a while so, before I get back into the shallow albeit pretty things I usually talk about, I figured I may as well write about the brilliance that my life is. Perhaps “brilliance” is out of place there. Anyway, if you follow me on Twitter you’re probably bored of reading my tweets about my other half but I’m afraid to say that’s the biggest part of my life right now. He’s currently in hospital receiving treatment for an illness he was diagnosed with in December last year so I feel a little lost without him. He is doing really well though and will hopefully be released from hospital on Monday. I’m not entirely sure if he’s comfortable with me splashing his illness (I’m not even sure illness is the right word for it) all over the internet so I’ll refrain from saying what it is. His diagnosis was completely unexpected though and we definitely did not think it would be as serious as it is. He was only told 2 weeks ago that he would be going into hospital for treatment so no one has really had much time to process what’s happening. It actually hit me that he was going into hospital when we were buying pyjamas for his stay and it hit me quite hard. I wasn’t entirely clued up on the treatment and the unknown was rather terrifying. A quick google search the night before he went into hospital (I was doing my best to not research the treatment on the internet in case I found something negative) helped ease my mind. That’s quite possibly the first time google has ever given me something positive when looking into a medical topic. So that’s my other half covered now let’s move onto my dog – this transition makes sense as they’re both equally crazy and sleepy. My puppy is currently in boarding at the moment since my parents are on holiday (my mum is the main trainer for Teddy) so this is a little taste of when he moves onto his next lot of training. I didn’t think I would get so attached to a dog but I really miss the little wiggly thing (seriously, he wiggles, what even is that?). I’m going to be absolutely distraught when he moves on into his quest to become a Guide Dog; a quest he doesn’t even know he’s on. Why have I just made my dog sound like Frodo? I guess the last thing I wanted to talk about is a bit of a dodgy subject as I don’t know who reads this blog (ah the joys of the internet). Needless to say though, I’m incredibly unhappy and extremely bored with a certain part of my life and I’m in the process of trying to change it. The issue is I don’t know what I want to change it to and it’s proving to be quite difficult. I am determined to get out of the boredom and unhappiness though, maybe Frodo will go on a quest to save me. Why the hell do I insist on blogging while hyped up on sugar? I just come out with really weird things. Where even is Frodo? How awesome is my Eminem reference in the title? No? Well then. Lately all anyone in my town has talked about is the new café that opened in the old county buildings. I must’ve spoken to a good, oh I don’t know, 3 people about it; it’s the talk of the town! You can’t blame us small town folk for getting excited about a new, shiny café; we’re just so used to our rundown establishments to the point where we’re confused when something that doesn’t have people fighting outside of it comes along. I’m really selling my town aren’t I? Anyway, my other half, my mum and I ended up in The Court House (located across from the petrol station I used to buy copious amounts of Freddos from in Kinross, Scotland) on a random Bank Holiday Monday I’ve never had to celebrate before. 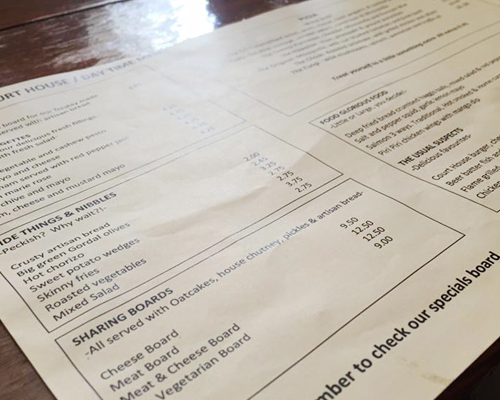 I had checked out the menu beforehand as the fussy vegetarian in me demands all places serving food are personally approved before going anywhere near them. Clearly the fussy vegetarian in me approved The Court House. 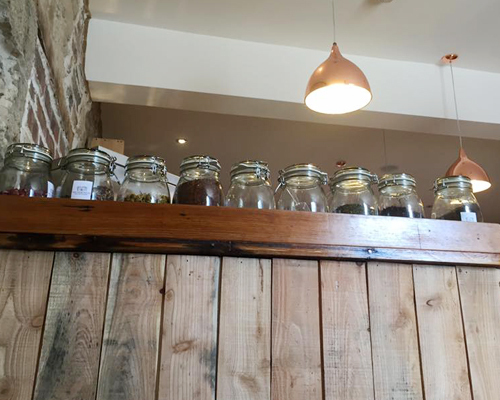 The décor of the café (or is it a restaurant? I have no idea) is my idea of a brilliant space. It’s rustic yet modern and oh so cosy. The Court House is a fairly large café that comes complete with an outdoor area and a pizza oven (yes, pizza oven!). I wish I had gotten more pictures of the café itself but I’m not quite past “self-conscious blogger” mode yet. I had decided prior to getting to The Court House that I would have the mozzarella, rocket and tomato panini (without yucky tomatoes of course) however, upon seeing the menu in person I discovered there was no such thing. The menu as it turns out has gone through multiple changes and as a result, the online menu is incorrect. Boo! 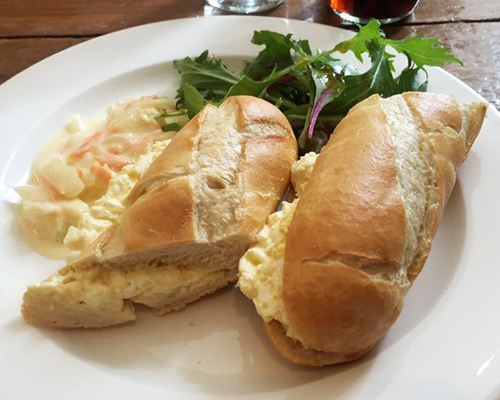 I did end up with a rather fabulous egg mayo and chive baguette which was both delicious and incredibly soft. Stupidly though the current menu has been laid out as if to say all fillings for baguettes come in panini form too which is not the case. It’s rather misleading and a rather poor design. Annoyingly I wasn't thinking about photos when I chose my seat so the window ruined everything. My other half and my mum both ordered the prawn Marie baguette which was apparently yummy but ew, prawns (can you see why I’m not a food blogger?). My mother also went for a cup of tea on a roasting hot day while my other half played it boringly safe with plain water. I being the unhealthy person I am ordered a coke but somehow they were completely out of coke so I had to go for the diet version. I would like to have some serious words with the person who thought of diet coke, what the hell were they thinking? After we’d finish our rather dainty baguettes with the salad and coleslaw on the side we had a goosey gander at the dessert menu. 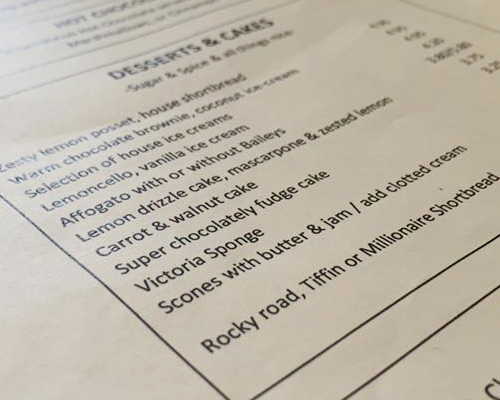 I’m not a cake person but if there’s chocolate fudge cake on the menu chances are I’ll probably order it so, funnily enough, I did just that. 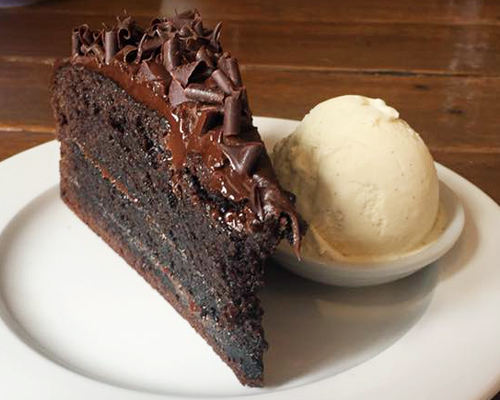 My significant other also went for the chocolate fudge cake but was a rather cheeky bugger and asked for ice cream too. Typically the cake doesn’t come with ice cream but our waitress and the chef were nice enough to provide it for him (and then didn’t charge us for it). I always like it when that happens. I’m quite glad I took the opportunity to go to The Court House when I did. I rarely get to see new cafes when they’ve first opened so it’s nice to see a place that already has a friendly, welcoming atmosphere and is building up a good reputation for itself. 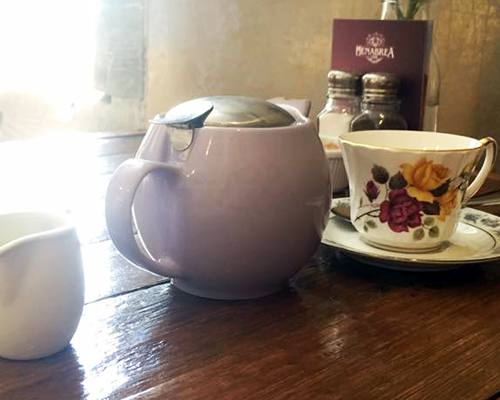 Sure there are parts that could be improved but I won’t hold any of that against them, they’ve got cute teapots after all. It’s that time of the month again - no not that time you gross little thing - its monthly favourites time! May was the month where I rediscovered some old favourites and added in some new ones which is always a good thing right? Well, it is for my bank account anyway. Okay let's keep the introduction short for a change and do this! Are you surprised to see these delightful things in my favourites after the review I gave them? Of course you’re not! 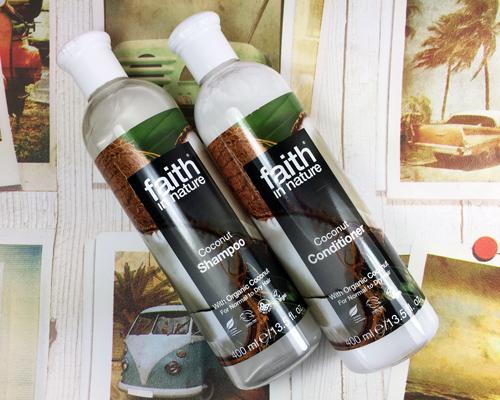 I absolutely adore this shampoo and conditioner, I love the coconut scent, I love the way they make my hair feel and I love the fact they’re made from natural ingredients. Basically I love this shampoo and conditioner. Note to self: read a thesaurus particularly the section on “love”. Okay this probably seems like the dullest choice ever but there’s a reason behind it. 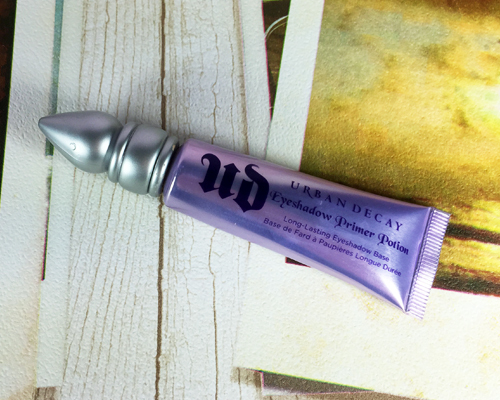 I use the Urban Decay Primer Potion every time I wear make up and I never really appreciate it. It wasn’t until I found myself staying somewhere that wasn’t home and was without my primer potion that I realised how much I love (ahh) this product. I had to go without eyeshadow that day in fear my oily eyelids and lack of primer would result in an eyeshadow disaster. 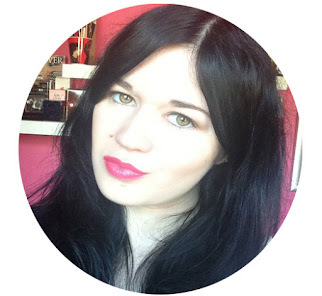 I felt naked all day so, as a result, my Urban Decay Primer Potion is in my monthly favourites. Wasn’t that a nice story? Oh hi red lipstick I abandoned for months on end. 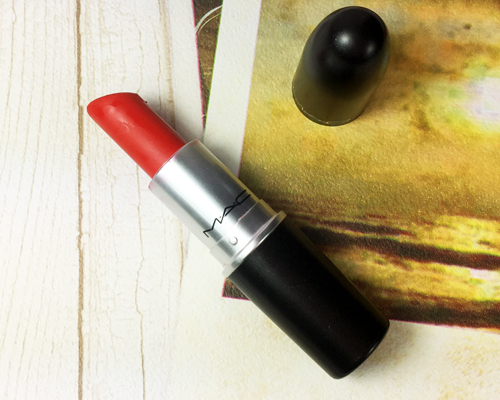 I randomly whipped Lady Danger on one day (to spend time at the aquarium, I wanted to look good for the fish) and was instantly reminded as to why this was the first MAC lipstick in my collection. I love (seriously?) a good red lipstick and Lady Danger is just that. 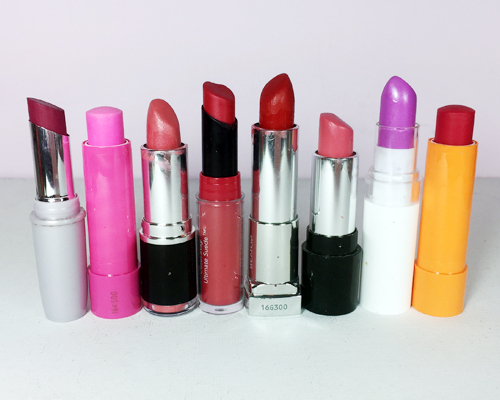 It’s the perfect in between shade of red and orange and, major plus, it doesn’t dry out my lips. Ah the latest addition to my morning showers! 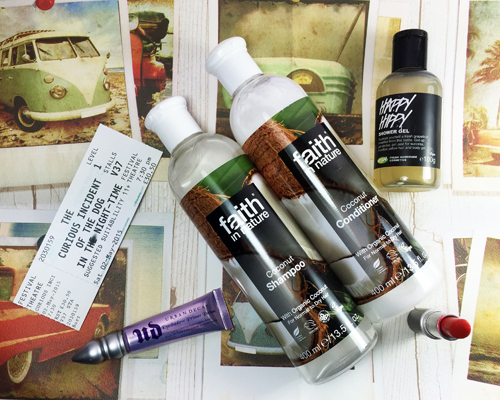 I’ve had Happy Hippy sitting in a cupboard for a good few months now so I figured, hey, I better use this stuff before it goes out of date. For me, this is the perfect shower gel to smell in the morning (aside from Dirty Springwash of course) as it’s zesty and fresh. 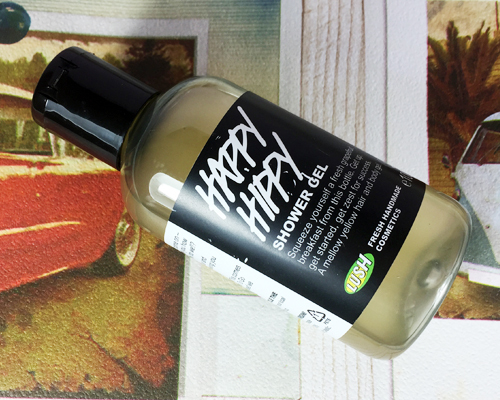 There are so many citrus scents that just don’t do it for me but Happy Hippy is the complete opposite. Did I mention it smells a little like Lemon Fanta? What’s not to like? 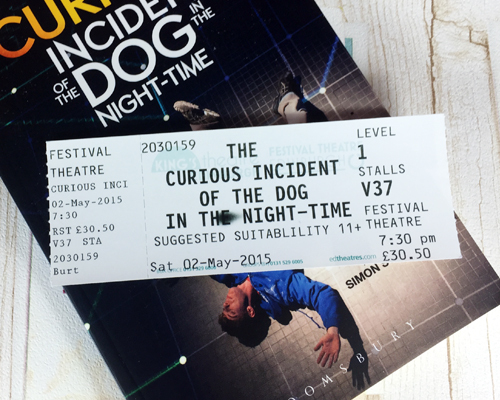 I can’t believe it’s now June but I also can’t believe how long it’s been since I saw The Curious Incident of the Dog in the Night-time. It actually feels like I saw this months ago rather than at the beginning of May. The Curious Incident of the Dog in the Night-time was one of my favourite books as a child so naturally, once I discovered the play was showing in Edinburgh, I had to see it. The play itself was not what I expected (although to be fair I didn’t have any expectations for it) but it was so well put together I just can’t help but rave about it. The puppy at the end was also a rather nice touch! Well there’s my scatterbrain of a May favourites. Annoyingly while writing this the heavens have opened and a large amount of water is beginning to form outside of my house. Is this definitely May?